During the fabrication of a crown or bridge, the dentist prepares the abutment teeth and takes an impression for the technician. The manufacturing of a crown or a bridge usually take up to 4-5 working days at the laboratory. For this period we will provide you a temporary restoration. 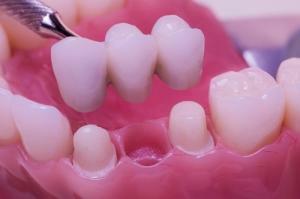 The final crown/bridge can be fixed with a permanent or a temporary material. In case there was a previous extraction, we always fix the bridge temporarily because during the healing time the bone tends to slightly lose on volume. To prevent leakage under the bridge, we take off the bridge 3-4 months following the extraction and let the technician add an extra layer of ceramics to that area. This usually takes only a day. The other advantage of temporary fixing is that in case of any dissatisfaction with the esthetics or function, we have the chance to correct that. 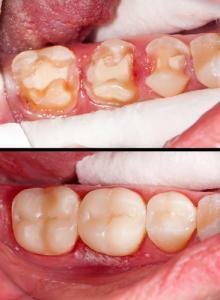 Temporary bonding last approximately 3 months in case of bridges and 1-1.5 months in case of single crowns. During this period you can decide whether the result suits your expectations. If you desire any alteration or correction, the dentist can take down the restoration and let the technician fix it in the laboratory. Individual crowns, regardless if the abutment is a tooth or just a root, can be cleaned like sound teeth, but bridges need certain cleaning methods. They need to be brushed very thoroughly and it is recommended to use an antibacterial mouthrinse. There are many special brushes and flosses available, that can be used to remove food remnants from underneath the bridge where the teeth are missing. If this is not performed on a regular basis at home, gum inflammation might occur that leads to bad breath. Various kinds of water-picks can also be of great use to ensure proper oral hygiene at home. We provide a two-year guarantee for our bridges, and recommend aur patients an annual check-up with their dentist. Zirconium-oxide has been in use for many purposes for years in medicine. Thanks to its favorable properties it gives us the opportunity to fabricate lifelike, authentic crowns and bridges. Zirconia crowns and bridges are primary recommended for the front area, mainly because it does not contain any metal and its translucency is similar to that of natural teeth. It covers perfectly any discoloration of root canal treated teeth and is a sufficient solution to metal allergies. The whole range of teeth shades is imitable with this material, so the dentist and the technician can prepare the crown according to the neighbouring teeth. Zirconia crowns can be adjusted to teeth previously covered with metal-based crowns and to implants as well. – patients around the world are satisfied. Many clinical studies prove its efficiency and its lasting for many years, even decades. – 100% biocompatible: it doesn’t contain any metal so the chance of an allergic reaction is basically zero. It stands up to the highest standards of implantology, therefore the gum is in perfectly good health around these crowns and bridges. – Due to the beveled preparation, the gum stays healthy and pink, will not get inflamed or turn blueish. – The zirconia base is prepared from the same colour as the overlying ceramics. Therefore not only is the top layer customized, but also the base itself. We provide a two-year guarantee for our bridges, and recommend our patients an annual check-up with their dentist. In cases where we don’t have sufficient amount of sound hard tooth structure to restore it, precisely if less than half of the tooth is lost due to decay or a previous old amalgam filling, we recommend an inlay or onlay because it provides more protection for the remaining structures and lasts much longer than a conventional filling would. It is a special type of “filling”, which is made by a technician at the lab. It can consist of specially hard plastic, gold, ceramics or zirconia. The most important feature of the inlay is that while the technician works on the cast, he can see and form parts of the missing tooth that are very hard, or even impossible for the dentist to reach or see in the mouth of the patient. This means a more accurate shape, surface and precise margins. Also it takes much less time for the preparation and the bonding of the inlay. Over moisturising of the prepared cavity can be avoided. It is possible to work on more teeth at one time since the impression is taken from a bigger part of the arch and contains many teeth. During the manufacturing of ceramic inlays, high pressure and temperature are being applied so the final piece will be able to withstand chewing forces. The colour and transparency of the inlay will perfectly match the tooth it is designed for, giving it a very high, esthetic finish that lasts for many years. For our inlays and onlays we provide a two year guarantee. One of the most beautiful, most well equipped dental clinic in Budapest, where our highly qualified team is ready to help in any case. Our professionals are internationally trained doctors who are happy to welcome you and give you a precise and swift solution to any problem you might experience. H-1027 Budapest, Fő utca 71.